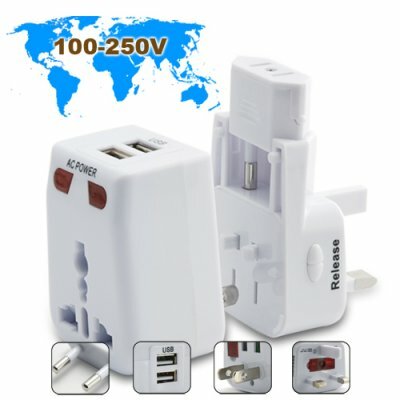 Successfully Added World Travel Adapter with Surge Protection + 2 USB Port to your Shopping Cart. World Travel Adapter with Surge Protection + 2 USB Charger for use at any time and at any place. This adapter's 3-in-one design fits all the most common outlet styles in the world and is great for use both at home and abroad. With this one universal wall adapter, you eliminate the need of bringing any other chargers with you when traveling. The adapter includes USB charging along with adjustable power plugs which can be modified to fit the Australian (AU), European (EU), American (US), and United Kingdom (UK) outlet style. It can be used in over 150 regions worldwide, including in your favorite travel destinations like: France, Italy, Sweden, Australia, New Zealand, Turkey, Africa, Brazil, Costa Rica, America, Canada, China, Hong Kong, Singapore, Japan, etc. Mainly for: Mobile phones, PDA, MP3 players, PSP, iPod, iPhone, travel speakers. Notes: It has a USB power port, which means it will work with about any device that charges through a USB that you can think of. Mainly for: Laptops, netbooks, DVD players. Notes: This is not just for the traveler. With a 100-250 volt output, you can pretty much charge anything at home or in the office that feeds on AC power, like all of those China manufactured electronics you have. Mainly for: Businessmen, foreign students, tourists, resellers, you. Notes: Who wouldn't get this? Not only is this travel adapter small enough to keep in your bag or at home for those "what-if" situations, it's also great to use with all your current electronic devices to protect them against surge protection. If you're looking for that one device to make your life and travels easier, then this world travel adapter with USB charger definitely won't disappoint. Order one for the office, one for your home, one in your briefcase, and even give some to your friends. Our low factory direct price also makes this an ideal item to buy in bulk for lower prices and then sell individually to your customers. Brought to you by the leader in factory direct China electronics - Chinavasion. How easy is it to use this travel adapter? Why can't I find the EU pins? Hold the two "release" buttons on the side to detach the UK pins and reveal the US pins. Turn the US pins and voila, you have the AU pins. The EU pins are hidden inside the UK unit and connect to the US pins. How is this world travel adapter so cheap? We are giving you a factory-direct OEM unit, you are not paying for a middleman or brand mark-up. Does this travel adapter work in Paris, London and Rome? I just need a US plug. I have all the rest. Can I buy just one adapter? Yes, and this is that one adapter to buy! Throw away those other ones since this works all over the world and is the only one you will need.